Encephalitis - body, viral, causes, What Causes Encephalitis? Encephalitis is an inflammation of the brain that can range from mild to extremely serious. It is usually caused by one of many viruses. Often the inflammation also affects the meninges (the lining around the brain and spinal cord). Such cases are called meningoencephalitis. Viruses and other microbes rarely get into the brain, but when they do, they can cause an inflammatory condition * called encephalitis (en-sef-a-LY-tis). Most cases of encephalitis are so mild that they are never identified. A person, often a child, may have fever, headache, nausea, or sleepiness—symptoms much like the flu—that go away on their own. But in more severe cases, the viral infection destroys so many neurons (nerve cells) in the brain that it can cause seizures, breathing problems, personality changes, and coma * . When white blood cells arrive to fight the virus, they may cause brain tissues to swell, which also can destroy neurons or lead to bleeding within the brain. Permanent brain damage, or even death, can result. * inflammation is the body's reaction to irritation, infection, or injury that often involves swelling, pain, redness, and warmth. About 20,000 cases of encephalitis a year are reported in the United States, but many more—mainly mild ones—are thought to occur. Serious encephalitis is particularly common in people with weakened immune systems, such as those with AIDS. Culex mosquitoes lay their eggs in water, and the eggs hatch into larvae as shown here. 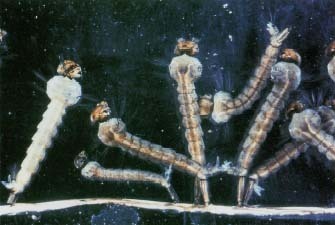 The larvae mature into adult Culex mosquitoes that carry the viruses that cause Japanese encephalitis, St. Louis encephalitis, and West Nile encephalitis. © Kevin and Betty Collins/Visuals Unlimited. Many viruses and a few other microbes can cause encephalitis. These include herpes simplex viruses, HIV, rabies, mumps, polio, and cytomegalovirus; the bacterium that causes Lyme disease; and the parasite that causes toxoplasmosis. Herpes simplex is the most common identifiable cause of encephalitis, but often the cause cannot be found at all. In addition, several arboviruses (meaning viruses spread by insects) cause encephalitis in horses or other animals and are sometimes spread to humans by mosquitoes. In the United States, this is rare, with a few hundred cases in an average year, but in Asia it is a bigger problem. In some cases, encephalitis develops as a reaction five to ten days after a person has a viral illness like measles, chickenpox, or rubella (German measles). This condition is called postinfectious or parainfectious encephalitis. What Happens When People Get Encephalitis? The symptoms usually start with sudden fever, headaches, nausea, vomiting, and sometimes muscle pain. If the meninges (me-NIN-jez) are involved, the neck and back often are stiff. Other symptoms can include muscle weakness and seizures. In more serious cases, a person may grow lethargic, or become angry and irritable, and eventually fall into a coma. Such cases have a high death rate. Encephalitis can be particularly severe in elderly people and in babies, who are more likely to suffer permanent brain damage than adults. St. Louis encephalitis, a virus found in birds. The most common form of encephalitis, with about 200 cases reported in an average year, mostly in midwestern and eastern states. Of cases severe enough to diagnose, about 5 to 15 percent are fatal, with the elderly at greatest risk. LaCrosse encephalitis, found in chipmunks and squirrels. It averages 75 cases reported a year, mostly in midwestern states in children younger than age 16. It is rarely fatal. Eastern equine encephalitis, found in horses. The most severe, it can kill as many as one third of those who get it, but usually only a handful of cases occur each year, in southeastern states. Western equine encephalitis, also found in horses. Despite its name, it can occur in any part of the country, although there have been no recent reports. It is rarely fatal, but it sometimes causes permanent brain damage in babies. In Asia, by contrast, Japanese encephalitis virus is common, with more than 45,000 cases reported each year in the region, usually in rural and agricultural areas. It is fatal in less than 10 percent of cases, but can be more dangerous in children. A vaccine to prevent it is widely used in Japan, China, India, Korea, and Thailand. The Japanese encephalitis virus is related to the St. Louis one and infects mostly pigs, ducks, and wading birds. Venezuelan equine encephalitis. Causes occasional epidemics in Central and South America. Usually mild. Russian spring-summer encephalitis. Spread by ticks, with death rates as high as 25 percent in some outbreaks. A vaccine is available in Russia and Europe. West Nile encephalitis. A milder relation of Japanese and St. Louis encephalitis, it occurs in Africa, Asia, and Europe. A strain similar to the West Nile virus was first detected in the Western Hemisphere in New York City during the summer of 1999. Murray Valley encephalitis. Found in parts of Australia and New Guinea, it is also related to St. Louis and Japanese encephalitis. It is rarely fatal. The symptoms will suggest encephalitis to the doctor. He or she usually will check for signs of a viral infection with various blood tests and with a lumbar puncture (spinal tap), a procedure in which a sample of cerebrospinal fluid is taken from around the spinal cord for testing. The doctor also may get a CT scan (a computerized x-ray) or an MRI (a magnetically produced image) of the brain to look for signs of bleeding or swelling in the brain. These test cannot make the diagnosis certain. Instead, the diagnosis is often made by ruling out other possible causes of the symptoms. In many cases, the microbe causing the encephalitis is never identified. In some instances, a doctor may get a brain biopsy, in which a small piece of brain is removed with a needle so it can be examined under a microscope. If the cause is herpes simplex, the antiviral drug acyclovir is given. Antiviral drugs may be tried in some other cases, as well. Corticosteroids (anti-inflammatory medications) may be prescribed to lessen swelling in the brain, and anticonvulsant drugs may be given to stop seizures. Supportive care is important. This means making sure people with encephalitis get proper fluids, providing machines to help with breathing, if needed, and caring for comatose patients to prevent bedsores or other infections. After recovery from encephalitis, some people will have lasting problems with memory, speech, or muscle control. For them, physical, occupational, or speech therapy can help to varying degrees. To prevent the arboviral (insect-borne) forms of encephalitis, public health officials spray with insecticides and drain swamps to control the mosquito population. If an outbreak does occur, individuals can use insect repellents or mosquito netting. Rabies encephalitis can be prevented by vaccinating pets and by avoiding contact with wild mammals. Avoiding ticks can prevent Lyme disease encephalitis, as can a partially effective Lyme vaccine. Preventing HIV infection—by avoiding sexual contact and by never sharing needles—would eliminate many cases of encephalitis. The World Health Organization posts a fact sheet about Japanese encephalitis and vaccinations at its website. U.S. Centers for Disease Control and Prevention (CDC), National Center for Infectious Diseases, Division of Vector-Borne Infectious Diseases, 1300 Rampart Road, Colorado State University Foothills Research Campus, P.O. Box 2087, Fort Collins, CO 80522. CDC posts fact sheets about Japanese encephalitis and about arboviral encephalitis at its website.